Our Oak Under Bed Storage Drawers are the perfect solution to your bedroom storage needs, and they match our Oak Platform Beds and Oak Mission Platform Bed perfectly! Hand made of premium Pennsylvania Red Oak (the best Oak in the world), these drawers will last a lifetime. Made in U.S.A with solid Oak faces and Southern Yellow Pine backs and sides, these beautiful drawers can be used with any of our platform beds or any other bed that has at least a 7 ¾ inch clearance underneath. Each Drawer (from left to right) is 36”, and they are 25” front to back. The sides and backs of the drawers provide 5” deep storage, while the face front is slightly higher at 7.25”. Comes ready to assemble in one compact box, no tools required. E-Z Assembly/Disassembly and this compact design also make this frame super EZ-to-Move. As with all of our solid wood bedroom furniture, you also get a 10 Year, direct-from-manufacturer Warranty (that would be us). For those experiencing Chemical Sensitivity, or for those who are just generally concerned about introducing toxins into your personal space, you can rest assured that wood used for the fronts and backs of these drawers are solid and free of chemicals! NOTE: This product does utilize luan for the bottoms, which does by nature of the product contain small amounts of glue. If you have strong sensitivities, call us to see if there are other options that can be explored for you. 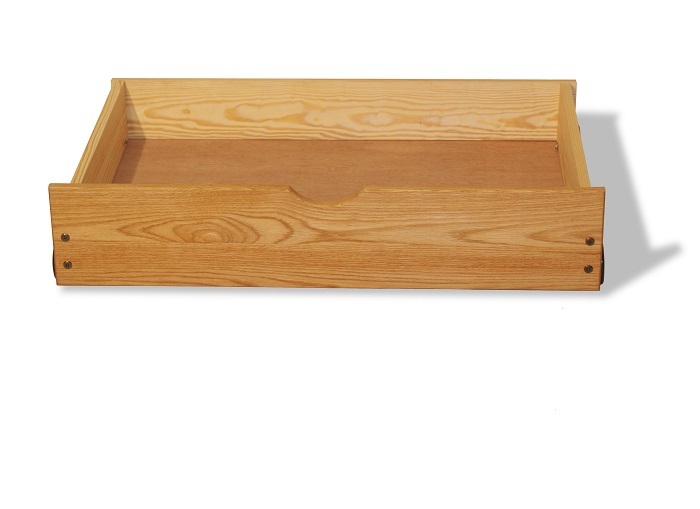 Our hand-rubbed Linseed Oil finish really brings out the beauty and color of the Oak, thus providing a simple, yet eco-friendly finish for your drawers. A full line of matching/coordinating pieces are now available so that you can build your room, piece by piece! Storage options include a rolling Oak Trundle Bed, Solid Oak 5 Drawer Chest, and Solid Oak nightstands, 1 Drawer and 3 Drawer styles. All of these pieces of course work perfectly with our Oak Platform Beds and Oak Mission Platform Beds. See our full Oak bedroom furniture line or Oak bedroom packages for even greater savings!! Made in Central PA by a mission-driven, values-focused, health-conscious company.